Massdrop is famous for bringing collaboration products to their online store and it is famous for doing so with well-respected companies in the audio industry. Their collaboration with AKG resulted in the Massdrop x AKG K7XX, a revisited K702 with the same appearance but a different tuning. They have been widely praised as great over-ear headphones and it’s now my turn to confirm that – they are in fact great. Disclaimer: I would like to thank Michael at Massdrop for sending out a unit to me. I won’t have to return it as far as I know. Massdrop sells the K7XX on their website at $199 in black and red. Using this link gives you a $20 discount on the red version (you will have one month time before the discount expires). 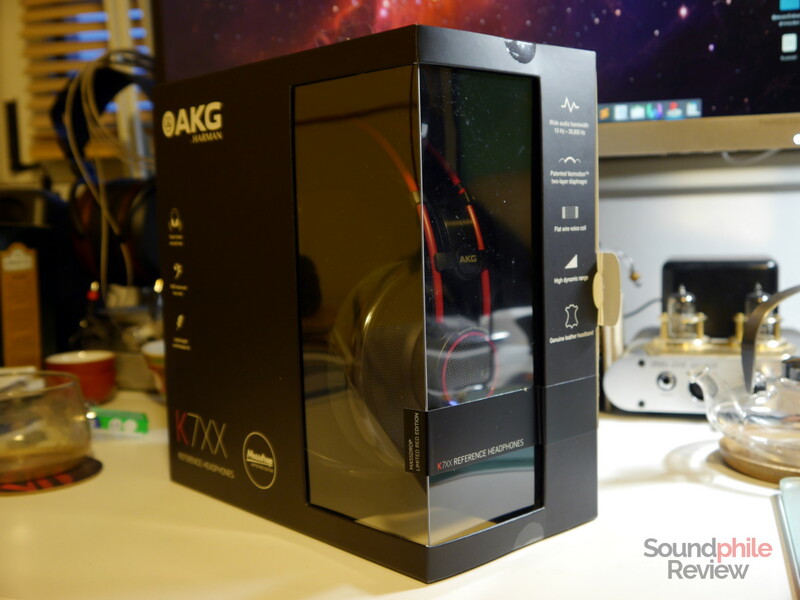 The AKG K7XX comes in a cardboard box with an elegant window to peek at the headphones inside. It’s not sophisticate or luxurious (it’s rather utilitarian, really), but it satisfies the eye without any doubts. In addition to the headphones, the box holds the cable and a 3.5 mm to 6.3 mm adapter. There are no fancy accessories. 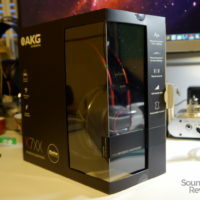 Both this fact and the utilitarian packaging are natural consequences of the low price: in order to reduce costs, AKG and Massdrop decided to cut on the unnecessary frills – and packaging was one of those, in this case. I can’t blame them for this choice; after all, the AKG K7XX try to deliver the highest possible value and I think that it is totally fair to save on these aspects of a product. That’s only my own opinion – you’re free to disagree, of course. The AKG K7XX are unequivocally AKG in their design. All the cues that made the design of AKG headphones famous are present: the plastic arches with a suspended headband, the large earcups covered with holes… These are quintessentially AKG. And that’s a very good thing, because this is a design that works and it works pretty well, too! This is also a limited edition red variant – the only one in its kind, as no other variant of the K7yy series headphones (using the “y” instead of the usual “x” for obvious reasons…) by AKG has red accents. I asked Michael about how limited this edition is, and he told me there’s a limited stock available, but I did not get any information on how many there are – so if you are keen on getting the Red Edition, get it before it’s out of stock! The headphones are entirely made of plastic: the earcups, the frame and every other part is just plain plastic. Thankfully, it’s good quality plastic. There are only two parts that are not plastic: the headband, which is made of genuine leather, and the metal sliding supports that connect the headband to the frame. Those are then linked to the earcups using rubber bands, so that they can adapt to the size of the wearer’s head. There are no creaks or other red flags of poor quality assembly; on the contrary, they appear fairly solid. The only possible complaint is that the sliding of the headband is not perfectly smooth – but it’s just an aesthetic flaw, as it works perfectly well. Given the price of the headphones, there’s nothing to complain about. 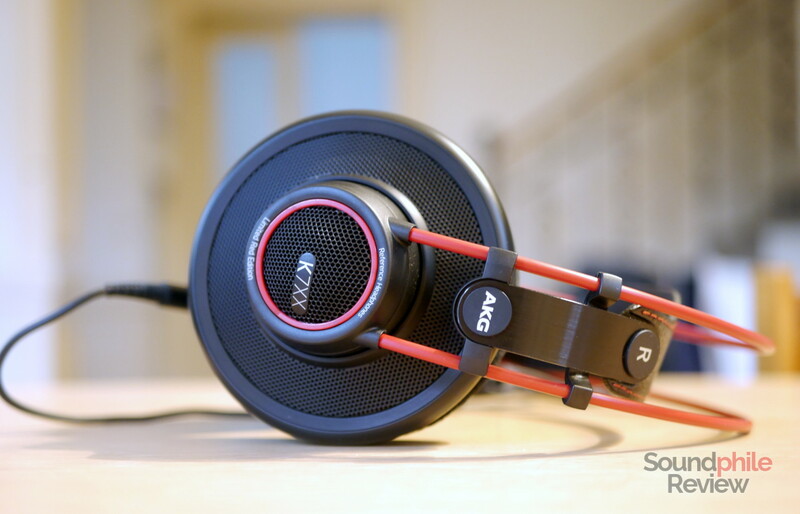 The AKG K7XX are insanely comfortable if we take the headband out of the equation. I am used to wearing headphones with large pads (e.g. HiFiMAN HE-560, Sennheiser HD 6XX), but the AKG K7XX are in a class of their own. Their pads are really huge! This, combined with the fact they’re soft and covered in velour, makes me barely notice they are there. 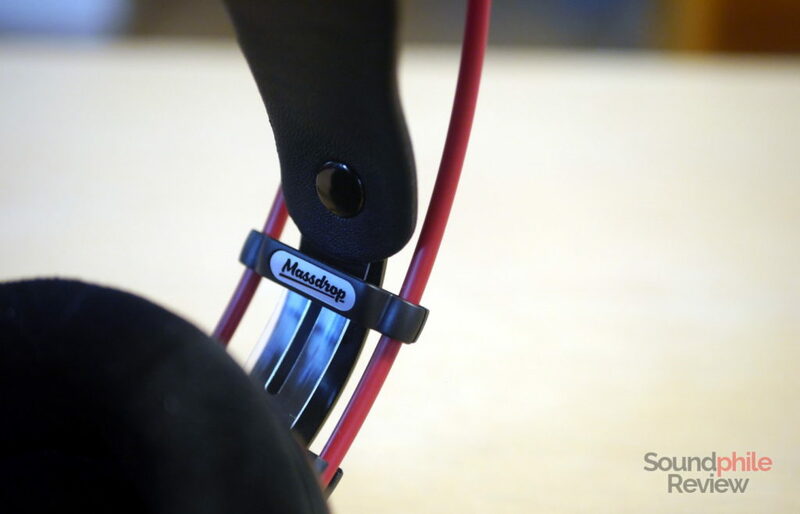 The headphones are also incredibly light (297 g), and this really helps in making them more comfortable. The only issue on this front is the headband, which has no padding whatsoever – something that my extremely sensible scalp doesn’t like too much. Putting just a little amount of padding, even just a folded fabric handkerchief, makes the K7XX much better (and that’s how I wear them, actually). 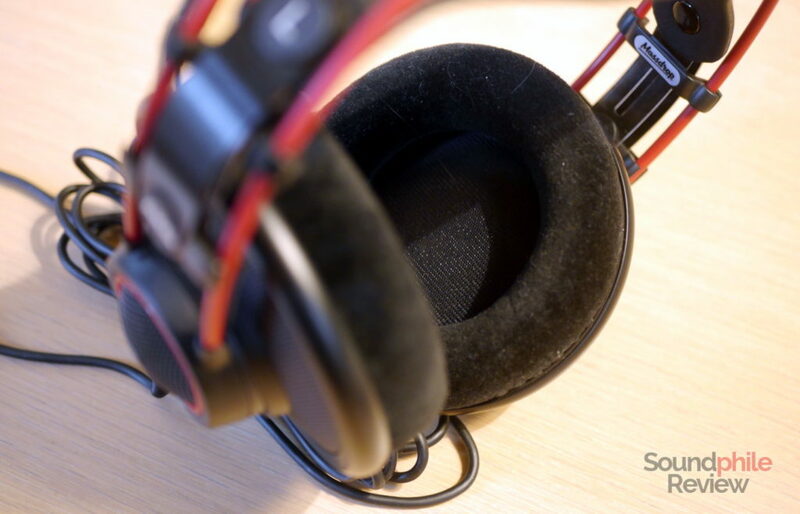 The earpads are removable and replaceable: in fact there are many options available on the market, including pads made by Dekoni and sold by Massdrop itself. I find stock ones to be more than satisfying, but some people may prefer leather (or pleather) pads. Although it might appear self-evident as the AKG K7XX are open-back, isolation is practically non-existent. They also leak quite a lot of sound, therefore they are not suitable for environments where keeping quiet is fundamental – offices, libraries and so on. 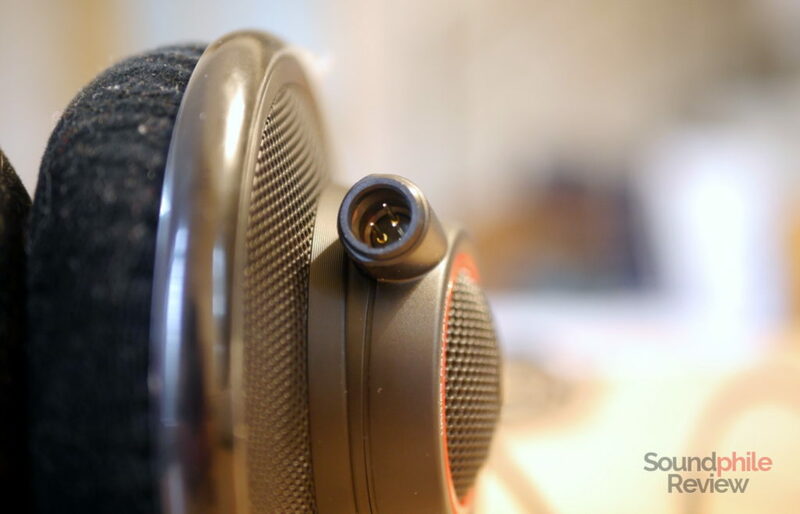 The cable has an XLR3 connector on one side and a 3.5 mm jack on the other, though there is a thread to screw a 6.3 mm jack adapter on. 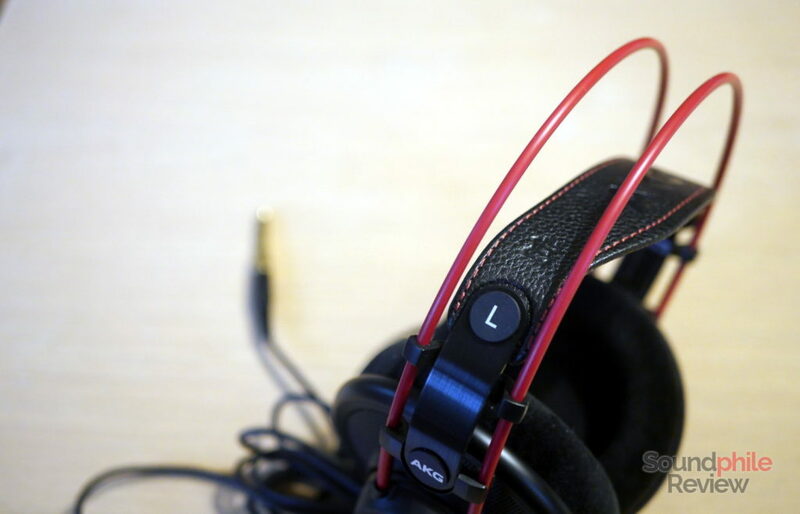 The cable in itself is the standard headphones cable covered in plastic without any special aesthetic or functional feature; it looks and feels like the average cable and does not have the “premium” connotation headphones like the AKG K7XX have. This is not to characterise it as bad; on the contrary, it is rather functional and serves its purpose really well. It just concedes nothing to aesthetics (which is why there is a market for aftermarket cables, I guess). Its 3 m length makes it really convenient for use with home theatre setups or similar situations where the source might be distant. This also helps if you want to use the headphones for gaming. 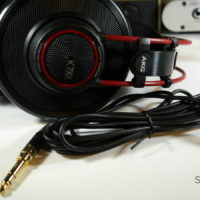 As it is XLR3, it precludes the AKG K7XX from being able to use a balanced connection: even using an XLR4 connector on the amplifier side, there would be no way to then bring all those four lines to the headphones. The only solution would be to re-wire the headphones to add a line so that there would be separate +/- lines for both channels. In order to test the AKG K7XX I used a few different sources, including: Topping DX7, Topping D30 feeding an APPJ PA1502A, xDuoo X10T-II feeding a Topping NX4 DSD. Whatever source I used, files were FLACs in standard resolution. The first two things that struck me about the AKG K7XX when I listened to them were the soundstage and the dynamic range. They are truly impressive and I do see why they are praised so much for this two aspects. The soundstage is huge. It sounds incredibly expansive, so much so that it feels like a very large room – not really a concert hall, but definitely larger than your usual headphones. What’s impressive is that it is not only very wide, but also deep. It is accompanied by an accurate imaging ability that places instruments with high accuracy on the stage, making full use of available space and distributing the instruments on the stage, giving each its own spot and therefore making it easy to discern them. It’s so good I got fooled more than once by how accurate it is: as a practical example, there are a few drumbeats in All Or Nothing At All by Scott Hamilton, Aldo Zunino and Alfred Kramer that appear far and located to the far right – and they are so well reproduced that I thought they were sounds in the room next to mine, so I had to double-check they actually were in the recording! Instrument separation is excellent, and it allows you to follow each and every instrument effortlessly even in the most crowded tracks (e.g. Grown Folks by Snarky Puppy) – also thanks to the fact they’re placed in different spots. 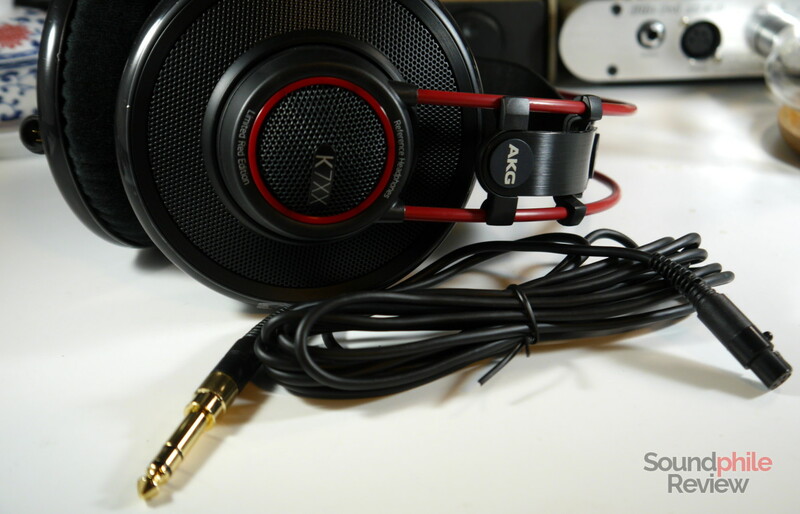 As I briefly mentioned before, the dynamic range is among the best features of the AKG K7XX. The headphones are able to reproduce both loud and soft sounds at the same time without letting softer sounds lose definition or making louder sounds quieter – in other words, the dynamic range is preserved and there is little compression (if any). This is especially noticeable with tracks such as Molino Moreno by Snarky Puppy, where there’s a lot of instruments playing together including hands clapping and drums. Those stand out and are noticeably louder than the rest, as you would expect them to be, while people cheering in the crowd are far quieter than the instruments playing but they’re still perfectly audible (at a much lower volume, too). There is a wide range of volumes shown at the same time, which makes the music much more alive and true to life. 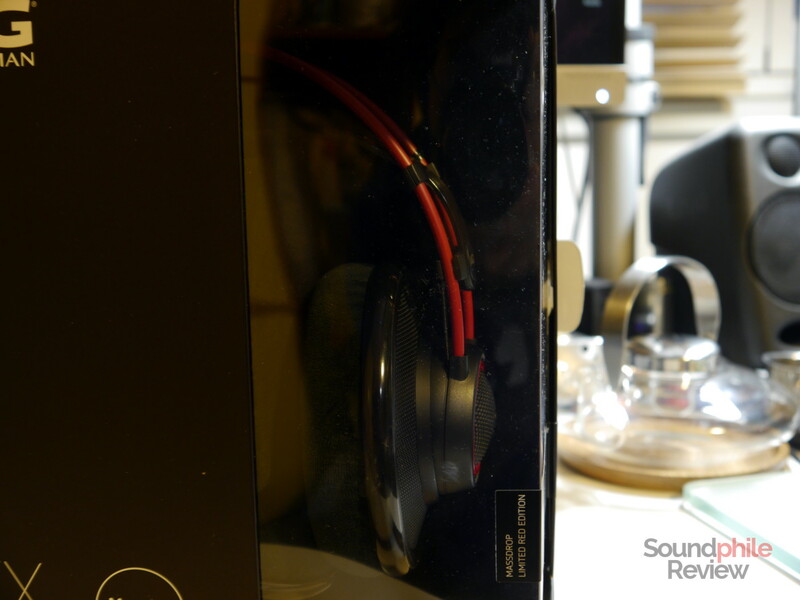 All this creates an incredibly clean and clear sound, which surrounds the listener with an incredible amount of details. The AKG K7XX really make you feel there, as they are able to get the right mix of details, dynamics, soundstage, imaging and tonality that almost makes you feel as if you are listening to a live performance. It is just an illusion, of course, and a bit of an exaggeration on my part, as there is no way to recreate the actual feeling of listening to a live performance – but it is really close to the best of what headphones can do. That’s not all. AKG managed to get the tuning right, too, and created a very balanced, if warm, signature that is great whichever genre you decide to listen to. The lower region is satisfyingly deep and very well controlled, with the right amount of presence to be heard and felt (and even a bit more so as to sound a bit warm). It goes as deep as 20 Hz, though there’s a bit of roll-off happening between 20 and 30 Hz. At 30 Hz bass is fully audible and present, which is quite an achievement. This depth gives lows authority and energy, as well as a full body. There’s a small bump in the mid-bass region that lends the sound a warmer appearance, but it is not significant enough to feel out of place or overwhelming – on the contrary, it is so gentle and finely made that it adds to the music without taking anything from it. Bass then flows to join the mids without any turbulences. Bass is very well controlled: all the smaller nuances emerge and are displayed in plain sight (or plain hearing, if you wish), so they’re really easy to hear even in congested tracks. It is this same good control that makes transients very fast and able to deliver the right feeling of impact. Drums, such as those in The Far Side of the World from the Master and Commander soundtrack, sound really fast and accurate: not only am I able to feel them, but I am also able to hear details such as the bouncing of the sticks on the leather at the same time. This makes bass incredibly apt not only for classical music, but also for modern, bass-heavy genres. Midrange is not as smooth as bass, but it’s noteworthy nonetheless. What I mean is that it is not as linear, as it has a few ups and downs that keep it away from neutrality – but do not take balance away. On the contrary, midrange is very well balanced and enjoyable, as it has no extreme spikes or dips that would make it sound unnatural or – well – unbalanced. There is in fact a small emphasis on the lower region, followed by a dip around 3 kHz and then a bit of emphasis again following it. The dip is significant, but I never felt it unless I as specifically looking for it. The added emphasis on the upper area makes brass instruments and other instruments with a high-pitched component (think violins, for example) more present and vivacious. Though not really bright, the sound appears more lively to me because of this. Like the lows, the mids have good speed and control; the level of detail is amazing, even more so considering how the detail is kept even in crowded tracks. Treble is a slight bit emphasised in the lower region, but then is a bit jerky with lots of ups and downs and is therefore difficult to describe. As far as my hearing goes (~17 kHz) it is well extended, retaining good volume even at the highest frequencies. I guess this (together with the phase) is responsible for the width of the soundstage. There is a whole host of details in the treble area, which comes as a good surprise. Details are not presented aggressively, shoved in your ears; instead, they’re placed there so that you can pick them up. That’s to say that treble is never aggressive or fatiguing, but is instead placed forward enough in the mix to be easily audible. It is definitely not laid-back, either. This combination is a great compromise, one that allows me to easily hear everything – and up to the smaller nuances and micro-details – but preventing treble from becoming harsh and fatiguing, so that I can listen to the K7XX for hours on end. Compared to the Massdrop x Sennheiser HD 6XX, the AKG K7XX tend to display more prominent bass and treble. Bass is deeper and more physical, with a larger impact; midrange is warmer as the upper range is recessed; treble is more prominent and more extended and thus displays details more. 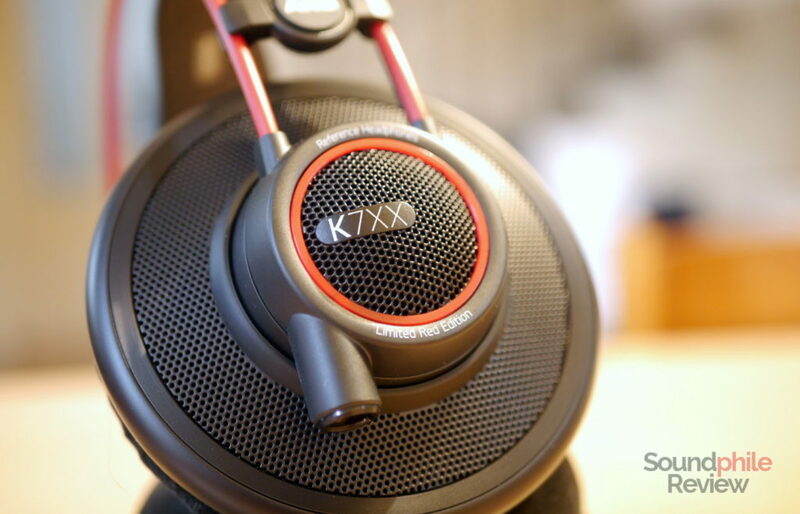 The K7XX is more lively and engaging, whereas the HD 6XX is more laid-back and smooth. Soundstage is far wider, while instrument separation appears to be better in the sense that instruments are better distributed across the stage and are thus easier to locate, but they’re otherwise not too far off each other in their ability to distinguish instruments. I would not say that one is better than the other – more that they’re different. A small, final note regarding how you can use these headphones. I see the AKG K7XX recommended as “gaming headphones” all the time. I can weigh in on the issue and tell you that they work fantastically as gaming headphones: even if we were to take comfort out of the equation, the imaging and frequency response of the K7XX make them great when you play games as they highlight all the right things and give you an accurate spatial representation of the sounds in the game, so you will always be aware of what’s going on around you. That’s especially true if you couple them with technologies such as Dolby Atmos, which will make them insanely immersive (more on the Atmos for Headphones technology in my Plantronics RIG 500 PRO review). 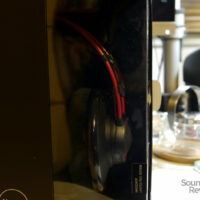 Finding great headphones (by audiophile standards) is not an easy task in and of itself. There’s plenty of good headphones on the market, but not too many great headphones – especially at $200 or less. The Massdrop x AKG K7XX are indeed great headphones however you look at them – and they would still be at two times their price. Although they do not offer fancy materials or intricate designs, they’re well-built and comfortable enough. What matters most, however, is sound – and it is downright incredible what the K7XX achieve at their price point. It’s hard to beat these impressive headphones, especially if you are looking for a very large soundstage with great instrument separation. Should you then buy these headphones? If warm (yet balanced) tuning with a bit of treble emphasis is your thing, then definitely go ahead: the AKG K7XX are extremely capable headphones that can satisfy even the most demanding audiophiles. They are so good I might say they are a must-have.